The Pignoni lab studies the fly to understand the nature of eye progenitor cells and to model human eye diseases. Genes that act at a very early stage in eye formation are of particularly interest, as these genes are most likely associated with the formation of retinal progenitor cells. Her previous work focused on multiple factors (genes) that control retinal progenitor cell identity, proliferEye Cell Type Graphication, and differentiation into photoreceptor neurons. Several of the genes currently under study (Pax6, Ato, and Mitf) are linked to congenital abnormalities in mouse and humans, such as anophthalmia (no eyes) and microphthalmia (small eyes). In collaboration with Dr. Zuber, Dr. Pignoni's team is analyzing the role of a novel factor that is essential for neuronal development in frogs. Parallel work in frogs and flies aims to gain a detailed understanding of how this novel factor contributes to the formation of neurons. The powerful genetic techniques available in this organism permit the identification of all genes required to make a fly eye. In a large scale mutagenesis screen, a team of investigators in the Pignoni lab is testing which of the~9,000 genes shared between Drosophila and humans play a role in early eye formation. Thus far, some 250 candidate genes have already been identified, and it is expected that many will also be important for vertebrate eye formation. A second phase of the screen, in collaboration with Dr. Zuber and Dr. Viczian, will extend these findings to vertebrates (frog) and mammals (mouse). The fly model system can be used to better understand the effect of the human disease genes on photoreceptor viability and function, as well as to explore avenues for intervention at the level of genetic pathways and cellular processes. 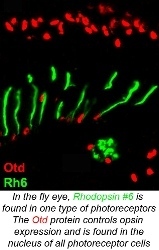 Mutations in the light-sensing Rhodopsin molecule are associated with human blindness. Interestingly, some of these same mutations also result in photoreceptor degeneration in flies. Thus, the fly photoreceptor cell is fundamentally susceptible to the same damage that leads to degeneration of human photoreceptors. Collaborative work with Dr. Knox investigates the nature of the several Rhodopsin mutants linked to retina degeneration (Retinitis Pigmentosa - RP).